Which NBA Players Deserve Signature Shoes? Paul George is the latest NBA athlete to get a signature sneaker, who will be next? we break down the most likely candidates. A signature sneaker is one of the toughest feats to accomplish as an NBA player. If you look around the league and stay within the big three of Nike, Adidas and Under Armour—there are only eight active NBA players with signature brands. The criteria for being a signature athlete is tough, with the obvious ultimate goal of selling as many shoes as possible. When a brand selects a player to model a shoe, it's a multi-million dollar investment in one single player. It’s a gamble to really see how well a player's marketability can transition into footwear and apparel products. Do they have the style and charisma? Do they have what it takes to be the face of a brand? All elite shoe endorsers such as LeBron James, Kyrie Irving and Stephen Curry, all have something that makes them profitable off the court. Nike recently added Paul George to its signature roster of athletes and the PG1’s have garnered rave reviews from consumers. So who is next? We compiled a list of six guys who may have what it takes to earn their own signature sneaker. Porzingis was one of the hottest sneaker free agents of 2016 thanks to his standout rookie season with the Knicks. The Latvian native won over fans quick with his personality and ability to produce on the biggest stage in Madison Square Garden. He stands 7'3" and became the first rookie in NBA history to post more than 1,000 points, 75 three-pointers, 500 rebounds and 100 blocks in a season. After his Nike contract expired this past fall, Porzingis signed a multiyear footwear and apparel deal with adidas, as reported by the Vertical's Nick DePaula, that will pay between $3 million and $6 million annually. It's also the most lucrative shoe deal for an European player. That is a solid investment for a player with only one year in the league. Porzingis joins the likes of James Harden, Damian Lillard and Andrew Wiggins on a budding adidas roster. Porzingis has shared marketing duties with Wiggins to be the face of the adidas Crazy Explosive this season. What is scary is that we still don’t know what Porzingis can become, but investing in a 7-foot unicorn can’t be too bad. The Adidas KP1 does have a nice ring to it. Giannis walks the same line as Porzingis in terms of being a signature sneaker prospect. There is no ceiling for his potential. Also, like Porzingis, he is another unicorn with a charming personality. His growth into superstardom has been one of the best stories this NBA season. What comes with investing in Giannis is his international popularity and the rights to a pretty good nickname that can be branded everywhere—“The Greek Freak.” Nike doesn’t really hand out signature deals that often, but it would be smart to position Giannis against Adidas and Porzingis in that international market. 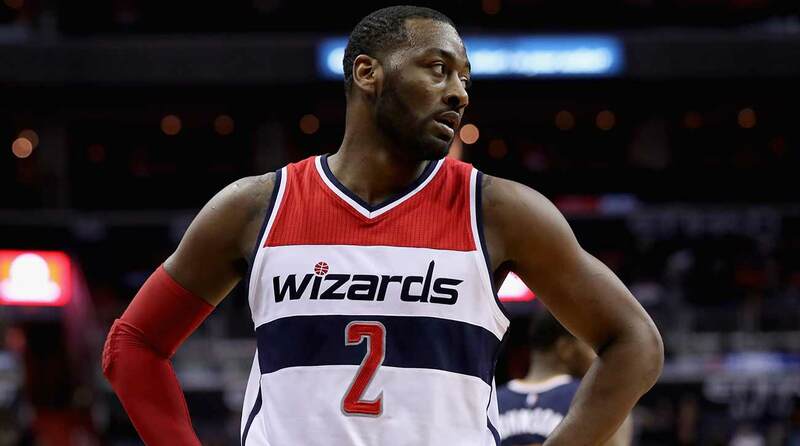 John Wall has one of the most complicated sneaker stories ever for a player of his caliber. After bouncing around shoe deals with Reebok and Adidas, Wall has been wearing Nike models throughout the past year. He is by no means a signature shoe rookie—he has had three different signature sneakers released, but they all were underwhelming. Wall has matured into a star this season and deserves a fresh start—whether that is with Nike or someone else remains to be seen. What would make the most sense is for Under Armour to sign Wall to a lucrative deal and take some of the load off Steph Curry. The brand is in desperate need for another basketball athlete after striking out on other marquee names like Kevin Durant and Porzingis the past couple years. It is also worth noting that UA’s headquarters are located in Baltimore, which is not that far from the D.C. area. Under Armour please give John Wall a call. After Paul George, it seems like Anthony Davis is next in line at Nike for his own basketball silhouette. Davis has been marketed on several campaigns for the Swoosh. He is already a star and has had his a fair share of commercials, but there's one major complication: Will an AD basketball sneaker actually sell? It is a question not directed towards his athletic ability or his personality, but his standing as a big man/post player. The only way a “Brow” shoe can be successful is if it is versatile enough to be worn by big men and guards. He’s been part of Nike’s PE program for several years which is a step right under the signature roster. He has been wearing the Nike Air Max Audacity 2016 throughout the season. OK, I am pulling for a Kawhi signature sneaker, but I am not sure if Kawhi actually cares about getting a signature sneaker. He has an underrated sneaker game thanks to some solid Jordan PE’s. Having a signature sneaker within the Jordan Brand is not for everyone. The brand has a process of adding players that is built in the image of Jordan. It's the reason why players like Chris Paul, Carmelo Anthony and Russell Westbrook have signature models in the brand—they are some of the most ruthless competitors in the NBA. You can also add Kawhi to that list despite his calm demeanor. Jordan has released a couple new performance models this year, the Jordan Extra.Fly and the Jordan B. Fly both used by Victor Oladipo and Michael Kidd-Gilchrist. If they can get their own models to market, Kawhi can easily join the ranks of having his own signature sneaker. In terms of having his own basketball shoe, Nick Young probably has no chance at adidas. But with his popularity and his style, they can easily go the Westbrook/Jordan Brand route to give him his own lifestyle model. He has enough charisma and a sense of fashion to carry an off-the-court shoe. Over the years, Swaggy has made some of the boldest fashion statements on and off the court. Adidas must find a way to utilize him before his time is up.